Russia cast a veto at the United Nations Security Council on Tuesday preventing the renewal of the mandate for a mission that investigates the use of chemical weapons in Syria. The investigation by the United Nations and the Organization for the Prohibition of Chemical Weapons (OPCW) - known as the Joint Investigative Mechanism (JIM) - was unanimously created by the 15-member U.N. Security Council in 2015 and renewed in 2016 for another year. Its mandate is due to expire in mid-November. The JIM is due to report by Oct. 26 on who was responsible for an attack on April 4 on the town of Khan Sheikhoun, held by the opposition to Syrian president Bashar Al Assad, that killed dozens of people. 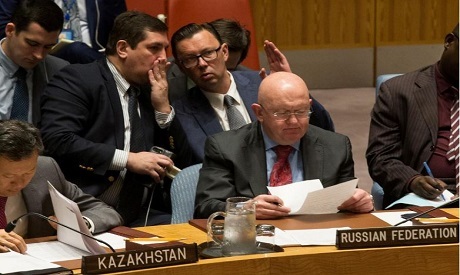 Russia wanted to discuss the report before voting on the extension of the mandate, and its UN Ambassador Vassily Nebenzia unsuccessfully asked to postpone the vote. "Don't try to create the impression that the JIM will be a dead letter unless we adopt this resolution today," Nebenzia said prior to the vote. A separate OPCW fact-finding mission determined in June that the banned nerve agent sarin had been used in the Khan Sheikhoun attack, which prompted the United States to launch missiles on a Syrian air base. "Russia has once again demonstrated it will do whatever it takes to ensure the barbaric Assad regime never faces consequences for its continued use of chemicals as weapons," U.S. Ambassador to the United Nations Nikki Haley, traveling in Africa, said in a statement. China abstained from Tuesday's vote, while Bolivia joined Russia in voting no. Eleven countries voted in favor of the text.